§0.1 — There is a future, perhaps even a probable one, in which this short text—of just 64 words—has the status of a Pre-Socratic fragment, at least, minutely examined by multiple philosophical schools, determined to extract every last micro-flicker of its significance. In this speculated culture to come, these words compose an intricate sign of what is about to arrive not only caught in the final moment before the shift, but self-identified as a spark—intimately linked to the spark—from which the shift came. It is trawled up from the other edge, where an accumulation of techno-cultural reaction mass is about to go nova. Caught at the very lip of the reaction pile, it is a piece of critical code. §0.2 — Were the virtual catastrophe to be even greater than it imaginably could be, so that only the first sentence had survived—time-charred by the sheer magnitude of the event—it would still suffice as a compact summary of our entire topic, and as the germ of an intelligible retro-futural tradition. Just seventeen words now, and yet almost everything is still said, arranged in accordance with a distinct internal structure that divides neatly into three parts. §0.3 — It begins in a virtual theater, where a complex play is opening. The topic of identity is itself concealed, as if wrapped in an invisible cloak. It is nothing technical, or even theoretical, but rather the narrative propeller that comes first. “I’ve been working …” the hidden author tells us. The personal pronoun, we understand eventually—if not immediately—refers us to a mask, and to a drama that is yet to unfold. The great conceptual themes of anonymity and singularity first enter the stage, in casual clothes. (Extreme acuity would have been required to notice these themes already foreshadowed in the word “cash”.) This miniature story about time and “work” means far more than it yet seems to. §0.4 — After the play begins, space remains for a generic definition of Bitcoin—as a “new electronic cash system” or innovative techno-commercial (i.e. techonomic) synthesis, a “machine” in the rich, rather than the narrowly technical sense (because it encompasses incentives)—and also for an initial (two-step) abstract specification of its operational principle as a “fully peer-to-peer” or true network, which is itself succinctly defined through subtraction, or independence from any kind of “trusted third party”. The deletion of “third parties” or quasi-transcendent overseers—as revealed, retrospectively, in this artificial future—has been socio-historical process, and not mere conceptual speculation. Much has happened over the span of our hypothetical elapsed duration. Boundaries between the inside and the outside have been redrawn many times. What were once scarcely legible hints are “now” lucid indications of realized occurrences, accessible to public designation. Yet even back then—where we still are—it can only have seemed that a great deal was ready to be found. When these words were teased apart patiently, with the surgical tools of a philosophy that was itself—at that very moment—undergoing drastic revision, everything was already here, at least in conceptual embryo. §0.5 — This short text is unmistakably a fragment about “Bitcoin”. It is destined to be still more so. The retrospective concerns of what remain, at the time of writing, unconsolidated interests will insist upon that. Yet the term appears only once outside the heading, in the second sentence, and even there it is not nakedly deployed, but is instead embedded within a hyperlink (or URL). This is surely sufficient excuse for an early digression. The familiarity of Internet links, after what has been, even now, only a couple of decades of wide social dissemination, tends to deprive them—as a general semiotic phenomenon—of the attention they would otherwise command. They are rushed beyond the horizon of awareness by their own smooth utility. The same high-speed familiarization is characteristic of technological adoption in the electronic era, whose futuristic strangeness is thus self-concealing. §0.6 — Every URL is a technical implementation of rigid designation, which is to say that it works not by saying, but by pointing to some definite thing. It is thus the demonstrative confirmation of a semantic theory, but operationalized to such a degree that its implicit claim is rendered superfluous, through transportation beyond all meaningful controversy. It would be entirely redundant to argue that URLs work. The proper name of that thing meant by any URL can be compressed and mangled to such a degree that its signification is obliterated, yet it works (when—in the case of an “unbroken” link—it does) as an effective invocation—by actually calling up that to which it refers. On the Internet, the conceptual problem of reference has been mechanized. To write using links is to participate in a literal machine. In multiple senses, therefore, it “represents” a death of metaphor. §0.7 — The rest of the mail composes a separate systematic unit, devoted to introducing the Bitcoin protocol in (a little) more detail. It takes the form of a sub-headed five-point list, striking for its informality. What initially appears as a logical structure buckles significantly under analysis. The second point, for instance, is essentially a re-statement of the first, separated only by distinct emphasis, since the functional completeness of the P2P network and the absence of any need for trusted third parties constitute a single (or numerically identical) accomplishment. The third point, while approximately accurate, might be considered misleading in two ways. While permitting anonymity, the Bitcoin protocol does nothing to positively protect it. The passive facilitation of anonymity is both unremarkable and, from a technical perspective, notably weak (as would later become evident). Satoshi’s two final points are also interconnected, although in this case the articulation reflects a real synthesis—or techonomic advance—rather than mere semiotic overspill or logical redundancy. The socio-technical Bitcoin machine validates itself in the same way it spreads. §0.8 — Philosophers searching for the systematic order of the Bitcoin protocol in the logical architecture of a list such as this are looking in the wrong place—comically so, one might easily think. The chat is not the code. Yet, everything attending the arrival of Bitcoin is of such monumental philosophical importance that errors of over-reading can still serve as a corrective to neglect. Much more is still being missed than over-interpreted where the Bitcoin phenomenon is concerned. The occurrence is outpacing its sense. §0.9 — The problem is not that this fragment is being read at all, or with exaggerated attention, but that it is being read the wrong way, insofar as it is considered to be a logically-ordered list, or a table of categories, rather than the linguistic translation of a circuit diagram. Disorder—and ultimately paradox—is the positive attainment of a cybernetic statement. It is especially notable that Satoshi’s five-point list of Bitcoin “properties” explicitly describes a cycle, ending where it begins, in a return to the topic of double-spending and its effective prevention. This circular formulation, too, is a mark of technical functionality, rather than logical indiscipline. Bitcoin loops back, to close upon itself, because it works (and demonstrates that it works, through actual perpetuation of its existence). “Problems” of self-reference are an operational virtue, requiring positive achievement. The guiding principle is not conceptual comprehension, but machinic closure. §1.0 — Strictly speaking, Bitcoin has to be unintelligible—or at least incompletely intelligible—because it necessarily delivers more than it signifies. What the word designates vastly over-spills its recuperable (human) meaning. This is a fatality already implicit in the basic conception of distribution, in the sense of systemic decentralization. To bring any such (intrinsically distributed) “object” into focus, as the target for concentrated, comprehensive attention, is impossible by definition. The attempt drives investigation diagonally, into abstraction. It might equally be said—in a manner conducive to the elaboration of critique—that a network is inherently intractable to objectification. As we shall see here, and elsewhere (even, eventually, everywhere else), the translation from epistemological challenge to political provocation takes only the smallest—and least avoidable—step. §1.1 — The cybernetic consistency of the Bitcoin protocol is simultaneously technological and economic—we might (and shall) continue to say “techonomic”. Its achievement is inseparable from an orchestration of cryptographic procedures and financial incentives, such that exploitation of its economic opportunities automatically reinforces its technical operation. The result—which is, once again, inextricable from the concrete fact of its historical existence—is an actual cycle of self-reinforcement, independent of external legitimating authorities. It implements the first commercial regime to be policed—spontaneously—at the level of production. Its “miners” or primary producers are also its final financial arbitrators. Nothing like it has ever been seen before. §1.2 — There are no doubt innumerable “truths” about Bitcoin, of a kind familiar both to folk intuition and to disciplined traditions of knowledge acquisition—whether first-order (scientific) or second-order (epistemological, ontological, and metaphysical). Such moments of recognition will inevitably provision the discussion to follow. Yet there is more to the topic of Bitcoin and Philosophy than any of this. While Bitcoin is certainly another thing for philosophy to talk about, it is also an entirely other way of “talking” and of doing something that has been considered central to the philosophical enterprise since its inception—the cultural production of truth. Bitcoin establishes—and in fact ultimately is—an operational truth procedure. It is less a philosophical object, therefore, than a philosophical platform, and even a philosophical automatism. §1.3 — Bitcoin is inextricable from a practical interrogation of identity, in its social and psychological sense (as “personal identity”), but also more fundamentally as that which makes something such that it is not something else. The specific engagement with this concern under the name of the double-spending problem need not distract from its extreme generality, and—beyond generality—its transcendental implication. Bitcoin realizes an experimental ontology and epistemology in the course of a technical re-foundation of transactions (upon the Internet), which involves an abstraction of (if not finally beyond) money. The practical problematics of money and identity, nudged together over the course of decades by cryptographic theorists, have arrived—in Bitcoin—at a stage of radical fusion. For anything “simply” to be certified as that which it is cannot any longer be confidently distinguished from a monetary phenomenon. The new “-coin” suffix operates amphibiously between these previously distinct registers, as the index of an economic-ontological machine. (Big-B) Bitcoin, the system, goes further still. If being able to verifiably be itself makes of anything a unit in a currency system, the system itself is the Being of such beings—the ultimate criterion of credible existence. In the end, the blockchain cannot be subordinated to any principle of reality (whatsoever) that it does not itself authorize. 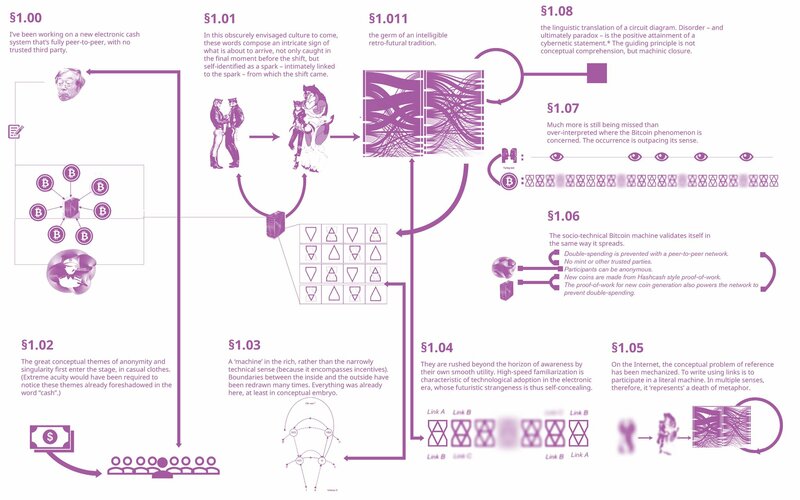 §1.4 — Since money, even in its most primitive and concrete forms, is already an abstraction—from the general commodity—its further mathematical virtualization tends naturally, from the perspective of common intuition, to a certain opacity. To recognize the reality of the virtual stretches human cognitive capabilities into stressed—and often distressing—territory. In addition, money occupies a thematic cross-roads of such diversity and density that its tangents can appear overwhelming, touching upon everything of human relevance, even prior to the massive dilation of monetary generality that Bitcoin is currently driving, under the sign of the new techonomic “coin”. §1.5 — Perhaps the greatest obstacle to the lucid investigation of money, however, is presented by the fact that it occupies a nexus of extreme sensitivity within evolved human psychology, lodged among our species’ most emotionally-charged perceptions of social relations. Because money is inextricably entangled with questions of reciprocity, it is tied-up intimately with such provocations to outrage as injustice, cheating, exploitation, and unbounded inequality. Such sensitive moral trigger-zones pose a formidable inhibition to dispassionate analysis. Disciplined investigation of money threatens to arouse sentiments of social alienation, and even desecration. There is no theoretical conclusion about the nature of money so cold that it does not appear burdened with concrete socio-political implication. More specifically, the mere conceptualization of money is grasped—once again, with vivid archaic intuition—as inherently consequential with respect to the social distribution of wealth. There can be no valorization or devalorization of money in theory without an immediate adjustment of social balances, or at least the widespread perception of such. It is only natural, then, that the complement also holds. Even when constrained by a spirit of disinterested empiricism, the study of money is peculiarly vulnerable to ideological temptations. The suspicion that monetary theory is politics in disguise tends towards a self-fulfilling prophecy. Discussions of money drive social apes mad. §1.6 — If money, nevertheless, demands to be discussed, now more than ever, it is because something huge is happening. So, really, how big is Bitcoin? This question—however awkwardly stammered—sets a backdrop to every discussion of the topic. If it could be answered exactly and comprehensively, we would know everything—seriously, everything—at least up to the epistemological horizon of man. Since Gödel, we have known that whatever can be known at all is precisely detailed in some yet-unknown number. Because the blockchain is a transcendental reality criterion, its ultimate summation is necessarily ontologically exhaustive. Whatever it doesn’t—in the end—include, can only be nothing. That is, however, to get ahead of ourselves. §1.7 — The size of Bitcoin lends itself not to one question, but to several, and all tend to rapid complication. When posed as a vague query regarding Bitcoin’s importance—or historical impact—the challenge posed is obviously daunting, in the way of all futurology. This does not, however, mean it can be long avoided. The question does not differ in principle from the kind of risk assessment speculative markets are continuously compelled to make (with mixed success, at best). It is, indeed, in large—and predominant—part a bet on the future, of exactly this type. If it is ineluctable, it is because the distribution of potential outcomes that it involves allows of no neutral position. Whatever happens to Bitcoin will matter to everything. Even the possibility that it might not matter much matters enormously. Shorting the Bitcoin future already offers enough space to thrive within—or in which to die. §1.8 — A more highly-restricted—and (at least superficially) simplistically quantitative—version of the question is easier to answer with facile confidence. No more than 21 million bitcoins will ever exist. The scale of Bitcoin is therefore intrinsic to its identity, and inseparable from its value. To purchase a bitcoin is to acquire one 21-millionth (and in fact a little more) of some as-yet incompletely determined “X”. On this basis, the immediate value of Bitcoin is analytical, which is to say, an exact re-statement of a quantity already given in its issuance. How much is a stock of 21,000,000 bitcoins worth? Of course, BTC 21,000,000. Naturally, a tautology this crude can at first only appear as nonsense, or—at best—as a semantic evasion. There is, however, nothing trivial about the disturbance it insinuates. §1.9 — Instead, and especially in the early stages of the currency, a synthetic valuation is called for, as determined by exchange rates. Typically, this will reference the world’s principal reserve currency, the US dollar, as a unit of account. At any point in time, therefore, the entire bitcoin stock has a determinate market value. Estimated in this way, the “scale” of bitcoin approached one hundred billion dollars by early 2018. The complex equivalence between this—comparatively paltry—financial evaluation and the appeal of the Bitcoin business as a venture capital opportunity, let alone as the core technology of an industrial revolution, presents a challenge of commensuration for which no existing road-map is even approximately adequate. It is unprecedented for the principal infrastructural innovation of a techonomic long-wave to take the immediate form of an investment vehicle. Extraordinary nonlinearity results. §2.0 — When viewed as an episode within a panoramic sweep, the history of Bitcoin almost writes itself. The crisis it inaugurates within political economy appears to have been dramatically predictable. Yet, when the Bitcoin protocol is examined more narrowly, its history—especially its early history—is notoriously puzzling. Fittingly, the story of Bitcoin—in its details—is profoundly cryptic. When scaled to tidal global processes, it appears to arise—as if inevitably—out of the Internet, which itself arose in conformity with the deepest trends of industrial capitalism. Upon finely-grained inspection, however, where the perturbations of contingency are most starkly evident, it emerged from the work of “Satoshi Nakamoto”, about whom scarcely anything is known with confidence. The obscurity concentrated in this name cannot be considered coincidental. §2.1 — While sweeping analogies reasonably invite suspicion, it is nevertheless tempting to compare Satoshi Nakamoto’s place in the history of money to Gödel’s in formal logic. In both cases a tradition accumulated over millennia through systematic consolidation and refinement of primitive intuition crosses a threshold of positive catastrophe, induced by a technical innovation that overthrows previously unquestioned assumptions. Once this passage has been made, what came before acquires the features of a prolonged childhood—an age of innocence and immaturity to which no return is possible. Logicians remained within an Aristotelian outer orbit, dreaming of an analytically grounded mathematics into the early 20th century, before Gödel awakened them. Prior to Bitcoin, the foundations of monetary theory remained similarly enmired in legacy conceptions, stemming from the concrete history of property representation. Bitcoin produces credibility, rather than consuming it. In this way it departs radically from the entirety of previous monetary history—or pre-history—while completing it. The word “epoch” is available for the historical periods initiated by such decisive switch-points which—in Nietzsche’s appropriately grandiloquent words—“break history in two halves”. The discovery, or invention, of transcendental arithmetic (Gödel), asymmetric cryptography (PKC), and trustless money (Bitcoin) are all structurally comparable ruptures. §2.2 — Ruptures are irreversibilities. They are thresholds from which there is no going back. Every rupture is thus a locking, a lock in, or trap-door. The secret of time finds in rupture its principle of integrity, or redundancy. There is no puzzle beyond this (which is merely transcendental philosophy restated). §2.3 — Secrecy has been an under-developed topic in philosophy. The reasons for this are arguably indistinct from reason itself, as such, and in general. “As we shall see,” we might add, insofar as humor is our object. In any case, a story of at least minimal plausibility is not difficult to muster. Secrecy is that which, as a matter of internal necessity, can only ever be under-emphasized, but in the case of philosophy there is immediately more to say. Since its birth in ancient Greece, philosophy has been drawn to the public square, and—according to some historical constructions—even arose there. It tends, strongly and stubbornly, to identify itself as the most elevated form of public reason. Since it is by way of a departure from the Hermeticism of the ancient mysteries that philosophy originated, it is a discipline bound by primordial vocation to exotericism. This cultural ancestry resonates profoundly with the archaic Occidental apprehension of truth as aletheia (or “unconcealedness”), and thus as an emergence or extraction from secrecy. In the words of Herakleitos (“the dark”)—invoking a primordial entanglement between what would become the cultural lineages of philosophy and cryptography—Φύσις κρύπτεσθαι φιλεῖ (“nature loves to hide”). §2.4 — Within the late-Enlightenment consolidation phase of modern philosophy, whose capstone is the Kantian critical system, the public sphere of intelligence is thematized as objectivity. This is the realm of common understanding, accessibly shared—as a matter of necessary principle—by all rational beings. For instance, there cannot, according to the Kantian construction, ever be a secret about space as such. Space understood transcendentally, as a pure form of objective intuition, rather than as an object itself, cannot contribute to the content of a private experience. A secret geometry is unthinkable, in this sense. §2.5 — Bitcoin is an open secret. Despite belonging unambiguously to the history of cryptography, nothing at all about it is hidden (except what lies beyond it). Its basic innovation—the blockchain—is a (decentralized) public ledger, and this now widely accepted explanatory term is not remotely misleading. In any case, the crucial terminological decision preceded Bitcoin, and was settled decades earlier with the introduction of public key—or “asymmetric”—cryptography (PKC). It is, precisely, cryptographic sophistication that makes the public sharing of critical information (prudently) practicable. This is exemplified by the blockchain, in which the details of every transaction are open to general inspection. Furthermore, full exposure extends beyond the (empirical) content of the blockchain, to its (transcendental) fabric. The Bitcoin protocol is open-source software, its entire code unrestrictedly available for inspection. Such radical openness is only distinguished practically from a comprehensive annihilation of privacy because the access to accounts is securely crypto-restricted, enabling digital “wallets” to function as disguises. The paradoxical culmination—now exhibited—is a cryptographic system without secrets. §2.6 — The basic current inherited by the Internet tends with irresistible momentum towards the open secret. The system of disguises is, ever increasingly, fully exposed. The Internet epoch, we learn, is the Golden Age of masks. Masks are not designed to be hidden, but rather the contrary. They are exceptionally conspicuous attire, meant for public exposure, to facilitate hiding in plain sight. Privacy turns out to be the reciprocal of an artificial face. §2.7 — It is only in superficial appearance that publicity and privacy can be simply opposed, which is not at all to suggest that the distinction can be integrated, or that either pole is soluble within the other. PKC definitively settles the relation. The real bond—or synthetic principle—connecting the public to the private is not a generic logical relation, but a cryptographic singularity. There is only privacy at all because this distinction is opaque to public reason. Philosophy—as it has traditionally understood itself—is asymmetrically related to cryptography, from which it is locked out by its (publically) unquestionable commitment to a principle of boundless publicity. The relation is poorly modeled by a tension between the public square and the inner circle—or between a commons, and a myriad vaults—and would still be even had it not been known since the late 19th century that squaring the circle is impossible. Already in the Kantian formulation of the transcendental philosophy the secret was distinguished from any type of concealed object. Its redoubt is not to be found in a transcendent mystery. It is located, rather, in the difference between the object and its principle. The secret of objectivity is itself concealed by the feint that leads to its misidentification with a hidden thing. §2.8 — The philosophy of secrecy fuses with definite practical realities. Bitcoin approaches the model of an ideal agora, at once commercially open and politically closed. It epitomizes the arena of “free trade” in all its innovative radicality and (from the perspective of the left) social aggression. Bitcoin is closed by its intrinsic protection against discretionary modification, and opened by its commercial function. Implicit in the circulation of bitcoins—or any other medium of exchange—is a process of commercial synthesis, latching the crypto-currency system on to something beyond itself. Anybody transferring bitcoins out of their own account, and therefore necessarily into someone else’s, is presumably engaged in an exchange which—since it cannot be realistically imagined as economically tautological (directly swapping bitcoins for bitcoins)—has to swap bitcoins for an extraneous commercial object. Clearly, whatever is exchanged for bitcoins, is priced in bitcoins. When it operates as a currency, Bitcoin is a synthesizer. It cannot propagate without connecting itself to a wider world. The cryptic principle of openness projects a diagonal line. §2.9 — Since the origins of modernity, a specter has been haunting the world—that of the autonomous industrial economy. This is the same emergent order that has acquired the name “capitalism” in the abstract, tendential, or teleological sense of the word, and—still more importantly—in accordance with its usage as a designation for an always only partially-defined real individual, or terrestrial event. Its signature is a regenerative, or self-reinforcing, intensification of socio-economic disequilibrium, “governed”—or, more strictly, made radically ungovernable—by a fundamental positive-feedback dynamic. “Capitalism” then, as a singular (or “proper”) rather than generic (or typological) name, designates the sovereign self-escalation of an innovative entity, defined only by the practical relation of auto-promotion it establishes with—and through—itself. What it is, in itself, is more than itself. Growth is its essence. This is easily said, but—as an irreducible logical anomaly—it is far less easily understood. This does not, however, obstruct its being named. Fernand Braudel writes of “the passionate disputes the explosive word capitalism always arouses.” Its would-be defenders, typically, are those least inclined to acknowledge its real (and thus autonomous) singularity. Business requires no such awkward admission. This, too, is a crypsis. By inevitable—if often awkward—irony, a species of “Marxism” tends to be regenerated in any systematic promotion of Capital. Even were this not the case, those who consider themselves befriended by Capital would rarely be motivated to pronounce upon the fact. §3.0 — According to the crudest—and perhaps also most plausible—account of Bitcoin’s inherent political philosophy, it implements a project of algorithmic governance that conforms to the deepest and most essential agenda of modernity, which is to say, of emergent capitalism, in its search for a definitive securitization of commerce against politics. It thus expresses—in contemporary techno-libertarian or crypto-anarchist guise—the primal impulse of liberalism (in its classical sense). As already noted implicitly, it is something most easily seen from outside. §3.1 — When captured at its zenith of abstraction and technical rigor, the defining proposition of the left is that depoliticization is still politics (and more specifically, a politics). This is not a proposition that can be limited to theoretical clarification. It is a project, and even a prophecy. The anti-political will be re-absorbed into the political, according to this fundamental formula. The whole of “class war” is contained within it. Its complement, on the side of capital, is an equally practical—and no less antagonistic—commitment to escape. The left thus recognizes its enemy, with striking realism, as an emergent—and intrinsically fractured—agent of social dissolidarity. A crucial asymmetry has to be immediately noted. The “struggle” here is not even imaginably one-on-one. Capital is essentially capitals, at war among themselves. It advances only through disintegration. If—not at all unreasonably—the basic vector of capital is identified with a tendency to social abandonment, what it abandons most originally is itself. That is why the left finds itself so commonly locked in a fight to defend what capital is from what it threatens to become. Bitcoin tells us—more clearly than any other innovation—what it is becoming next, by escaping transcendent governance in principle. Consistent “right wing-extremism”, automated governance, and unflinching critical philosophy are inter-translatable without significant discrepancy. The crypto-current is a nightmare for the left (rigorously conceived). It is other things, but that is the main one. Philosophical phase change doesn’t happen without a fight, least of all when attempting to route around one. “Bitcoin P2P e-cash paper” (2008/11/01) https://www.mail-archive.com/cryptography@metzdowd.com/msg09959.html. He looked at me, questioning whether I followed and, seeing that I did, he continued. With that he stopped to let me puzzle about what he had said. His last sentence reminded me of the classical paradoxes of Aristotelian logic, which was, of course, intended. So I risked a jump. Gödelian incompleteness is logically isomorphic with the halting problem in the (Church-Turing) theory of computation, and thus translatable after rigorous transformation into the uncomputable. It establishes a basic principle of unbounded application within the electronic epoch. As a corrective to the extravagant conclusions sometimes drawn from this conceptual complex, in relation to the limits of machine intelligence, the work of Jürgen Schmidhuber is of special importance. It should be noted, in clarification of this analogy, that the conceptual foundations of political economy (pre-Bitcoin) were far inferior to those of mathematical logic (pre-Gödel). The logicism of the Hilbert Program, and of primitive analytical philosophy, while ultimately untenable, at least provided an exact formal basis for its own theoretical elimination. The concept of property, in marked contrast, remains opaque to an almost comical degree. Its dependence upon a legal decision process invoking discretionary judgment essentially resistant to formalization, while convenient—almost by definition—to those wielding political influence, is a stark indication of its radical conceptual insufficiency. Property is reducible neither to legal title, or physical possession of precious substance. The former is a bad abstraction (to political dispensation), the latter an inadequate one (to a crudely naturalized relation). Another basic conception of property is now undergoing consolidation. Property is crypto-security. It consists of keys. There has been no cultural event more wounding to the persistence of a Kantian fundamentalism than the revolution in geometry attending the rigorous demotion of the Euclidean fifth (or “parallel”) postulate, as privately envisaged in unpublished work by Gauss (1813) and Schweikart (1818), mathematically publicized by Bolyai and by Lobachevsky in subsequent decades, generalized to higher dimensions by Reimann (1854), and then cemented into place by its empirical application to the cosmo-physics of general relativity. Kant’s conspicuous deference to Newtonian mechanics, understood as an apodictic (and essentially mathematical) intellectual revolution, sets the stage for the apparent vulnerability of his own position. The critical edifice seemed to have been built upon insecure “Euclidean” foundations. It is proposed here, however, that the retrospective attribution of embarrassment in this case is exaggerated, and follows from a profound misconception concerning the status of the Kantian transcendental aesthetic. Newtonian space provides only an occasion, not a strict model. The Kantian formalization of sensible intuition is less descriptive than telic, or retrochronic. It is the draft for an engineering project. The Gibsonian Cyberspace “Matrix”—in its resilient (because synthetic) Euclideanism—corresponds to a more rigorously Kantian conception. From the mid-19th century, it was understood that the possibility of squaring the circle depended upon the nature of pi (π). The Lindemann-Weierstrass theorem (1882) proves that pi (π) is a transcendental number, confirming the insolubility of the problem. It can be seen from this example how serendipitous the name transcendental number turns out to be. BRAUDEL, Fernand, Civilization & Capitalism, Volume I, p. 25. The coinage comes from David Golumbia: https://news.vcu.edu/article/VCU_professor_discusses_The_Politics_of_Bitcoin_Software_as_RightWing. Bitcoin was invoked on Halloween (2008/10/31) in a research paper published under the cryptic name Satoshi Nakamoto. It had the time format of a horror story. This is not the place to follow the Gothic roads thus opened, however suggestive they initially appear. Most notable, at this point, are the shadow undercurrents to questions about whether Bitcoin can ever die (or be stopped). Upon intense examination, neither possibility seems to be coherently thinkable.